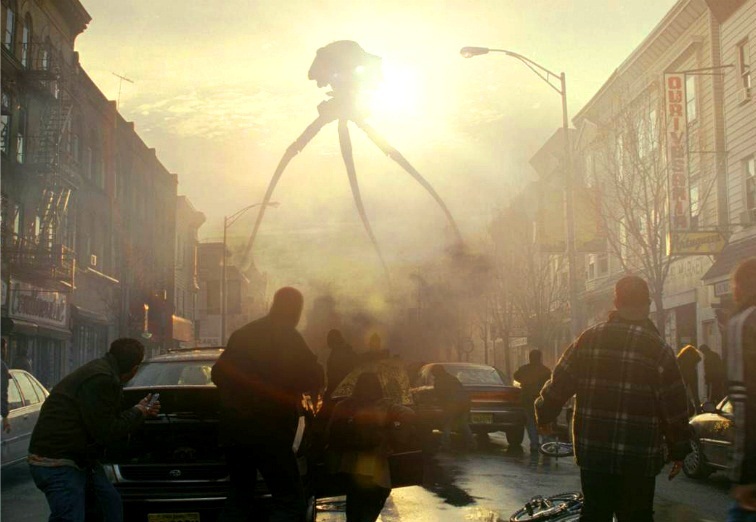 Not unlike the giant tripods from War of the Worlds they plan to watch over us, there are eight of them, they are white, they are very tall and they’re here! of your imagination but they are not, they are real, and they’ll become even more so as they grow and eventually start moving, and that’s when you’ll realise; the world of St Neots and its surrounding areas will never be the same again. In 2008, a war raged between Cotton Farm Action Group and a mighty corporation. It was the modern day story of David and Goliath; a local (and by local I mean Gravely) action group, armed with just a few helium balloons, several T shirts, some homemade placards, and a lot of talk actually managed, albeit temporarily, to put a stop to the evil corporation’s dastardly plan to introduce the giants to our backyard but that was only until it appealed and the insurgents were crushed for nothing can stop the proliferation of the titans as they assume key positions around the country. What am I waffling on about? OK, HG Wells it isn’t but there’s something so reminiscent of that story in this one. Alright, well maybe these machines don’t come from another planet but they’re just as scary (to some) nonetheless. I’m talking of course of the Cotton Farm Project that has just this month taken yet another giant leapt forward, one step closer to completion of the build of a wind farm just 5 miles or so from Saint Neots, Cambridgeshire, England (for you lovely readers who are joining us from around the world). Yes, like gods, these gargantuan machines will watch over our quiet countryside with all the menace of the tripods depicted in HG Well’s classic (or so some believe). The turbines will be so tall they will be viewable for a ten mile radius from their location at Gravely’s old WW2 airfield. The class A (whatever that means) airfield was constructed 1941-42 to the west of Graveley village which also happen to lie just 5/6 miles south of Huntingdon. Most of the land used was that of Cotton Farm and the construction also involved the bulldozing of an ancient Roman way road The airfield closed at the end of 1968 and was eventually reclaimed by Cotton Farm. The eastern end of the main runway still survived in the late nineties and part of the track was used as farm road until the site was spotted and ear marked as an ideal location for the wind farm in 2007. In 2008, nPower Renewables submitted its bid to convert the site. The original bid was actually rejected for a variety of reasons, including staunch opposition to the project but no sooner had it failed, nPower filed appeal papers, and try as it may, the Cotton Farm Action Group (staunch objectors to the project) failed to overturn the ruling and the appeal was upheld. It seems they were no match for the logical progression of the site and the need to satisfy our ever growing hunger for electricity. You can read more about my own investigation into the pros and cons of having a wind farm in your ‘backyard’ in my original article on the subject WAR OF THE WIND FARMS which was published in 2008 and reproduced on this blog last year. I researched the proposal and wrote an article on the subject after being bombarded by a lot of negative publicity from the action group (being that I live in one of the villages that will be visually affected by the new skyline). I wanted to find out the facts for myself and thus set out on my own journey of discovery. You can read about my adventure here. Indeed, the Cotton Farm project will affect a few villages as well as the visual aesthetics of the surrounding countryside (subject to your point of view on the subject – if you excuse the pun). The villages affected will include Gravely, The Offords, Great Paxton, Little Paxton, Toseland and Yelling. It’s believed that that the turbines will also be viewable from Paxton Hill, St Neots train station and some St Neots residential areas. Click here to view a video montage of the various perspectives (courtesy of the Cotton Farm Action Group via data submitted by nPower). Once the turbines are actually assembled, widespread panic is expected to ensue. Perhaps not as dramatic as some of the scenes from the 2005 movie but the pessimists are expecting panic in the housing market nonetheless where residents will be clamouring to abandon their homes as buyers run screaming in horror from the area. I covered this in my previous article so I won’t go into it again. Suffice to say, that the jury is still out on whether or not a wind farm ‘in your back yard’ will affect the value of your home. The cynics believe it does and that it will in this case whilst I failed to uncover any evidence to that effect in the research I conducted. So, what exactly is being built and what’s the timeline for this so called ‘invasion’? 8 wind turbines will be installed at Cotton Form, each with the capacity to generate 16MW and 24MW (depending on the type of turbine installed). A Turbine consists of 4 sections; the tower, the hub (to which the blades are fitted), the Nacelle (gear mechanism/engine), and the blades themselves. The foundations to which the towers will be fitted have already been laid, and delivery of the turbine sections is expected to start week commencing the 19th November 2012 (tomorrow). Delivery of the components and the assembly will take place throughout November and December 2012. The pieces will be transported on low level lorries specified as ‘abnormal loads’ and will be escorted by police. The lorries originate from Goole (yes, not Google), Humberside and will follow the A1 to St Neots, Barford road, they’ll circle Eynesbury on the A428 to Croxton, where they’ll make their way to the site. The turbines will be constructed in sequence as each piece arrives, with onsite storage between lifts. As part of its investment in Cotton Farm, Renerco (the company that acquired the consented project from RWE nPower renewables in 2011) is setting up a Community Benefit Fund that will be used to fund local charitable community projects within three kilometres of the site. 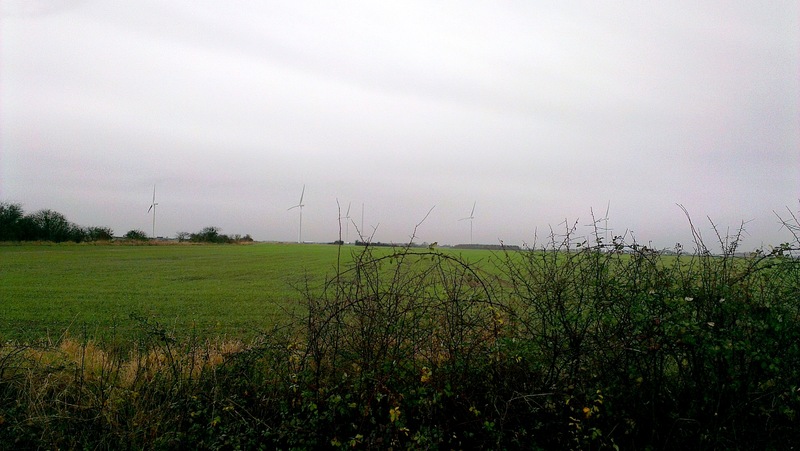 The fund is expected to raise £300,000 over the 20 year lifespan of the wind farm. The ‘CBF’ panel members will be appointed during November / December 2012 eventually culminating in a school open day at Cotton Farm in August 2013. When I originally wrote the article, WAR OF THE WIND FARMS, the UK government’s target for power by renewable resources was 15% before 2015. In September 2012, at 10:00am, wind turbines (both on and off shore) fed over 4.131 gigawatts into the national grid. That’s 10.8% of the total energy passing into the national grid. This is enough power to light and heat more than three million British homes. It’s believed that the harnessing of this green and free resource will ultimately drive down energy costs in the long term. Whether or not the generation of energy from renewable resources will actually translate into lower energy bills remains to be seen but ‘clean’ energy has got to be better not only for the environment but for all of us. Is it better to live under the shadow of a windmill than that of a nuclear power station? If you reached this link from Facebook, please be sure to LIKE and or comment and or share the article otherwise Facebook will stop showing ADA posts in your feed. Alternatively, subscribe to this blog by entering your email address at the top of the page and have new posts delivered directly to your inbox. You can unsubscribe at any time and your email address is not stored and thus cannot be shared with third parties. Well it really is Happening if I had to make a choice between Giant Windmills looking down on me like something out of “WAR OF THE WORLDS” or an Ugly looking Nuclear Powers Station ,or a smoking Giant Chimney I guess it would have to be these Giant Arms turning.But I have to admit the scale of these things was a lot larger than I had imagined and the view of our Local Countryside will be forever changed and admit that makes me sad ,but what would I rather have some ugly unit as neighbour blowing out Noxious Omissions .or something using a natural resource that is safe and Free ..
I’m sorry, but you can’t have a green world with the threat of neuclear power & fossil fuels polluting the very air we breathe…What pollutants do the wind farms put out? I’d much rather them than massive horrible dirty great power stations pumping crap into our lungs…The technology needs to grow & it will…I wish I had a small wind generator in my garden along with solar panels… Why can’t we all have those…Then there would be no need for any sort of power station? Until that time though…We have to put all our ENERGIES into renewable, green power & stop this building of dangerous neuclear reactors ! Honestly don’t know what to think, wish we could create giant air cleaners. We have them in our homes to rid pollution and bad smells. Cant help wondering if the same could be operated in areas where there is pollution to the hilt! Ideally prevention is better than cure, but don’t see any harm in helping out the environment to become fresher especially since pollution is not the best option and has overtaken us thus far.